So, as you might know, I have this... condition. I like to collect old board games. It's actually quite a fun way to spend the time. I enjoy hunting down the games, and then cataloguing the components, trying to find space for them on the shelf. Sometimes, when I'm lucky, I even get to play the games I own. Surprisingly, my wife seems to condone this kind of silly behaviour; and when she goes off shopping without me, she will always check out the charity shops to see if there is anything I might like. She once asked me what she should look out for, and I gave her one simple rule: "Never leave a Ravensburger on the shelf." This simple rule has yielded some pretty positive results. She scored a complete Enchanted Forest (1982 edition), which is in lovely condition, and one of my Christmas presents this year was an unpunched, unplayed copy of Scotland Yard, which I was so excited about I nearly did a little wee. However, there are exceptions that break any rule, and I was unable to disguise my horror the day my wife brought home Race Around Britain! I mean, seriously; you know this game is going to be awful. 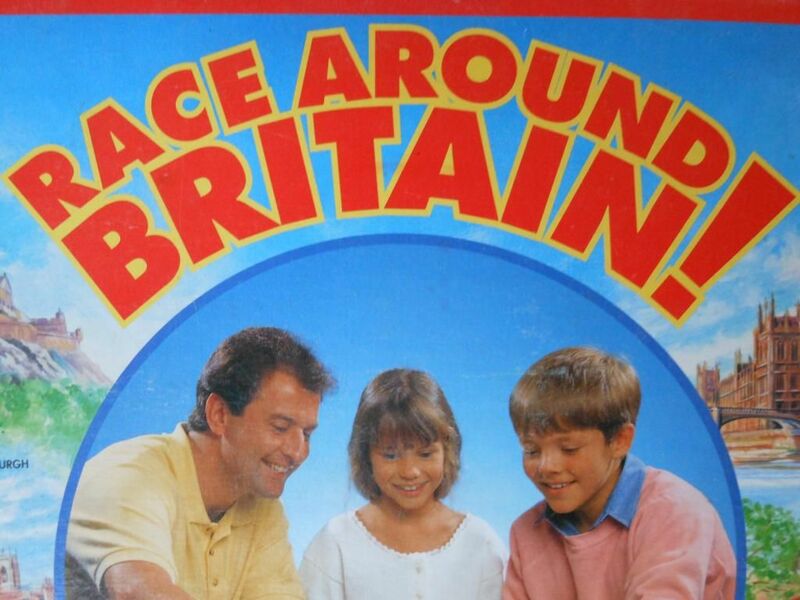 It has an exclamation mark in the title, and it's about travelling around Britain. 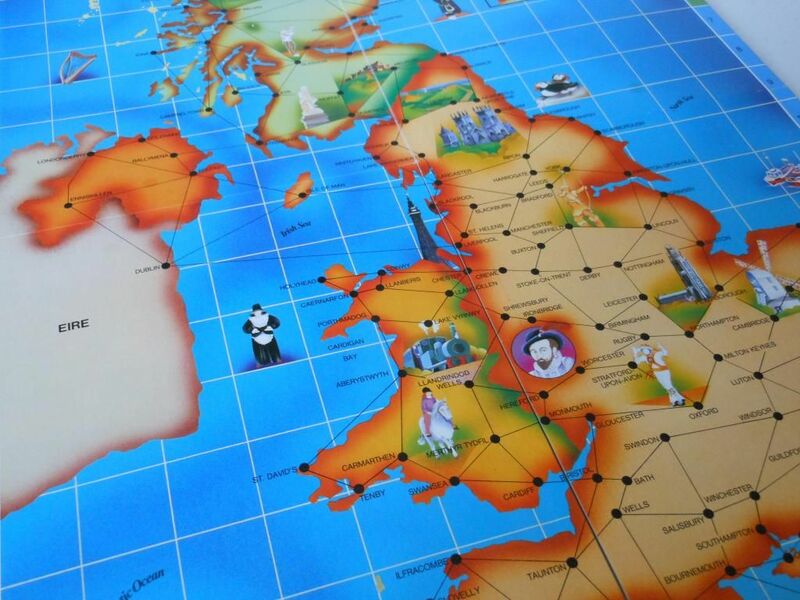 If I want to travel around Britain I'll buy a train ticket, not a board game. And that front cover? Showing two smiling kids, with their dad, playing the game... Yeah. That ain't fooling anyone. They look like they've just buried Mum under the patio and are trying to act natural for when the cops show up. 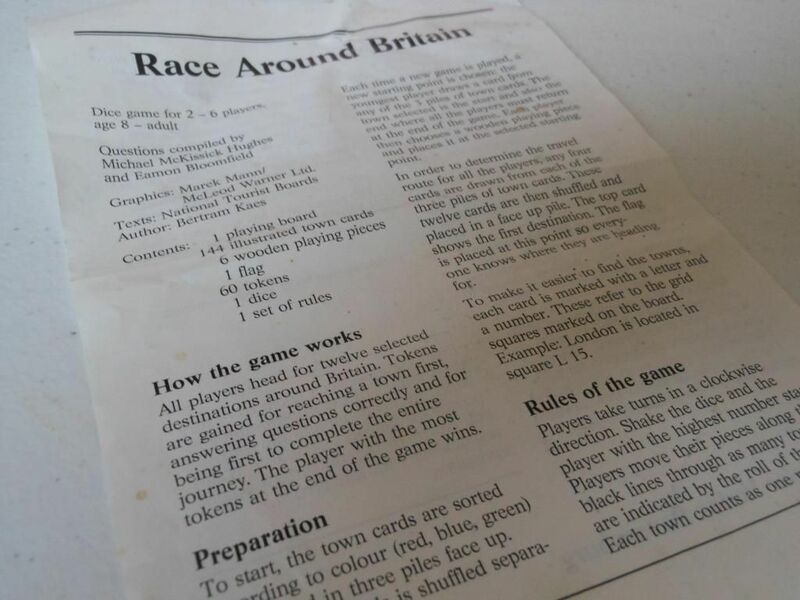 Race Around Britain! basically combines a whole bunch of game mechanisms I hate. They really took the time to make Britain look as dull as possible. 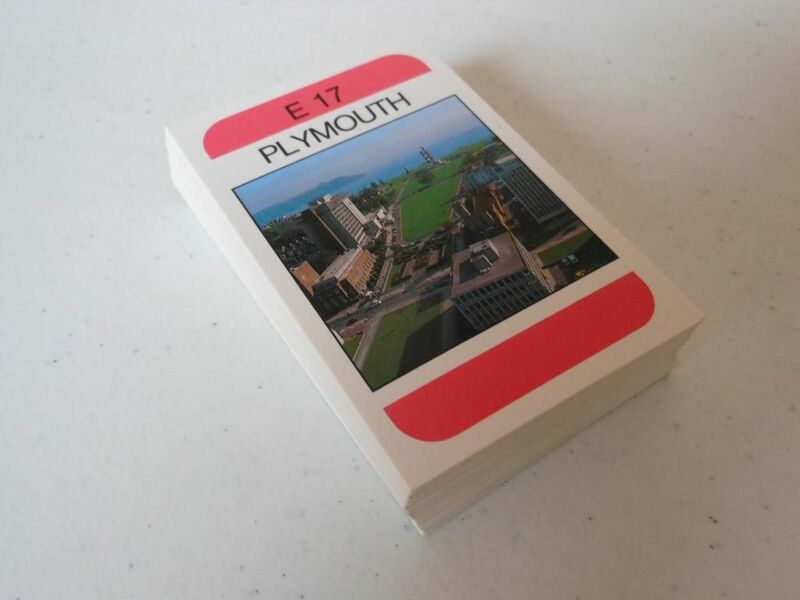 The concept is simple: A starting city is chosen, and then 12 other cities are selected at random (four cards each from three stacks of location cards). The top card is turned over, and the "race" begins. On each turn, a player rolls the dice (roll and move, hurrah!) and then moves the number of spaces indicated, heading for the currently revealed location. If a player lands on the location (and of course, this requires an exact roll of the dice), he or she wins two points. Furthermore, that player then gets to answer a trivia question about that location (hurrah! ), for the chance to win an additional point. After all that excitement, the next location is revealed. This continues until all 12 locations have been visited. And then all the players have to race back to the starting city. The player who reaches the starting location (by exact roll of the dice, of course), wins a bonus three points, and then everyone adds up their points to determine a winner. Not that anyone will care by then. 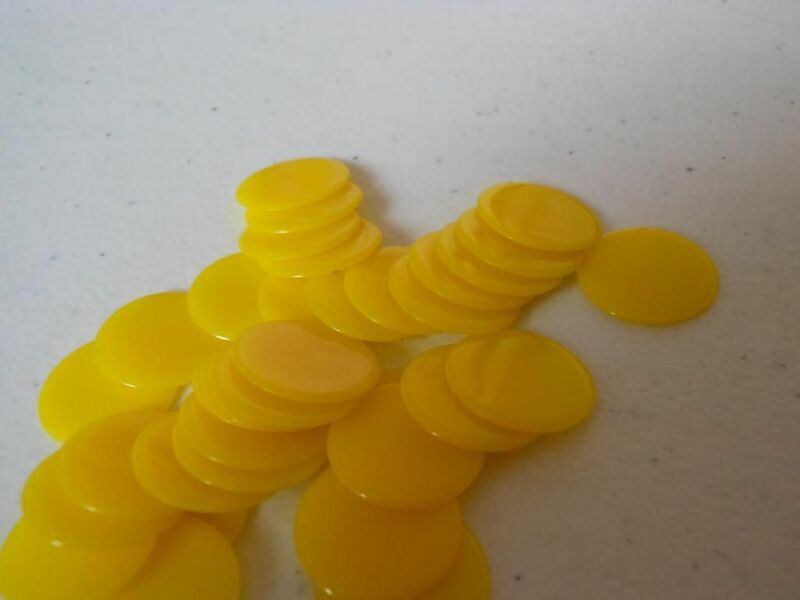 Plastic tokens for keeping score. So there you have it; a game that combines everything wrong with board games: roll and move, requiring an exact roll to land on spaces, and trivia. The trivia element is actually the least egregious aspect of the game. It almost makes sense. Most of the points are allocated to people who are lucky enough to roll the numbers needed to land on certain spaces, and the trivia element allows people who are not so lucky a chance to catch up. Of course, you only get asked a question if you land on the right location in the first place, so normally the questions just help the luckier people get even further ahead. The rules sheet - great job by the graphic designer, there. I can't even recommend this game as an educational tool. 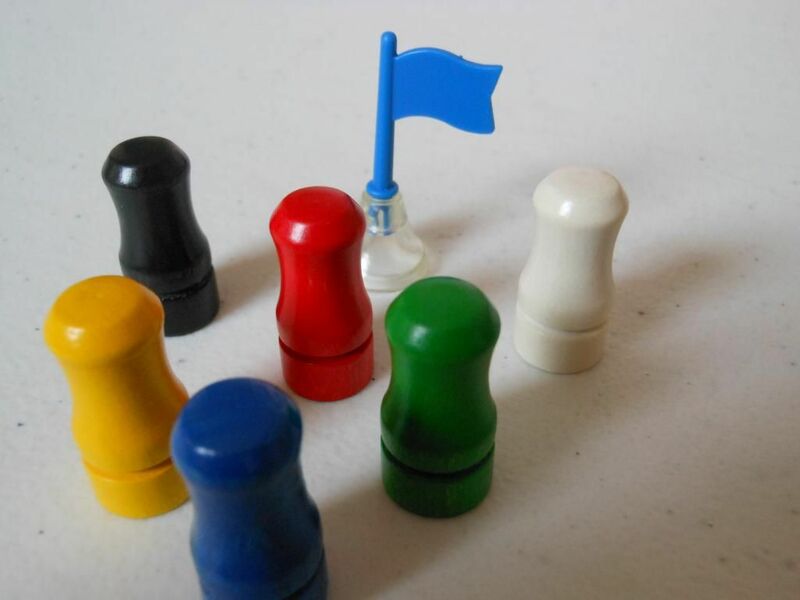 A game can last for a painfully long time, as each location needs to be reached by exact roll of the dice; and yet only 12 trivia questions will be asked. This is just as well, as there are only four questions for each city. If you played with any kind of regularity (which you wouldn't), you would quickly get through all the questions available. You could say that the game will help children learn geography, but the terminally dull gameplay, and the terminally dull artwork on the board, is hardly going to keep anyone interested long enough for any kind of learning to take place. Capture the flag... Or... You know... Don't bother... Whatever. Labels: charity shop shenanigans, doing a little wee, games for children, Race Around Britain!, Reviews, silly behaviour, The Vault, watch out there is an exclamation mark in the title, where did Mum go? 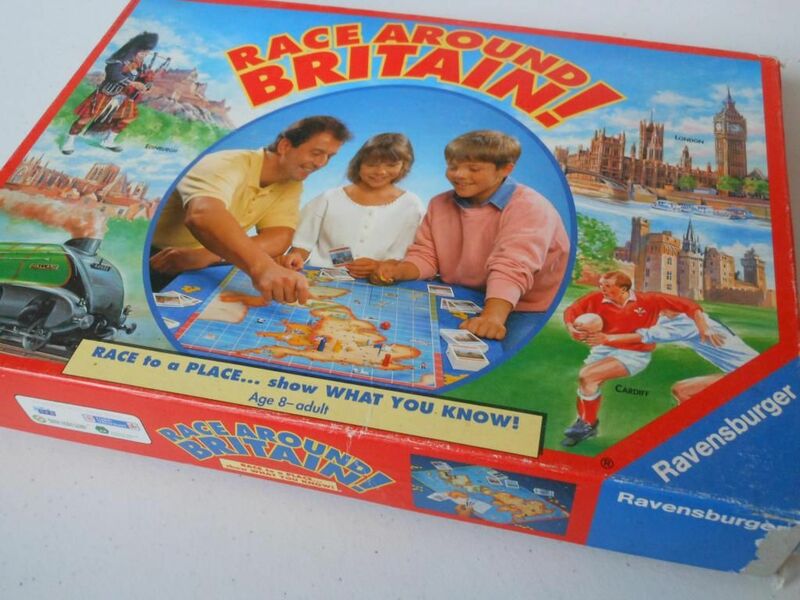 I just bought this in a charity shop- it came without rules- I then discovered everyone hates this game. I like the look of the game and I like the cards. I bought to help my children learn about Britain. We live in Japan. Here's my question, and I am going to pose this to other board gamers. Can we create a better game using the cards and board? Any ideas? You might just want to try playing it without needing to land on locations by exact dice roll, as that speeds things up. Other than that... I don't know, really. I fired this game from my vintage collection a while back, and I don't have enough interest in trying to improve it when there are so many better games in the world. I hope you enjoy it though.